NEW YORK, NY, Oct 3, 2018: Key Medium Founder Ali Jaffar and Creative Director Erkan Salhi were honored as 2018 Gold Winners from W3 Awards for developing a standout brand experience – for a nonprofit college that provides vocational programs for High Priority Occupations in North Philadelphia. Due to its dramatic overhaul in development, design, branding, and messaging, WFICityCollege.org received a Gold in the Websites – School/University category. Since launch, the site has generated an unprecedented amount of traffic, engagement, and buzz. The 13th Annual W3 Awards received over 5,000 entries from across the globe. 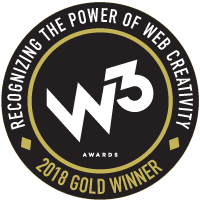 W3 Awards honors outstanding Websites, Web Marketing, Web Video, Mobile Sites/Apps & Social content created by some of the best interactive agencies, designers, and creators worldwide.